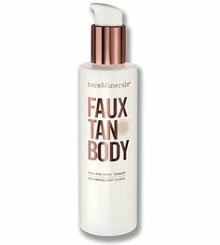 Comprehensive review of BareMinerals Faux Tan Body. See what actual users and real experts have to say about this self tanning product. Whenever companies changes their formula, people are very curious to see how it stacks up against the previous version. With BareMinerals Faux Tan Body; I’d say the change was pretty slight. Overall, this formula still produces a nice medium shade of bronze, and does it with a delicious cherry-almond smell. The color is a little lighter than the previous formula, but still pretty good. Applying this product is a bit of a pain, as the dark guide color is messy and it takes a little bot if effort to rub in. But overall, we like the new BareMinerals Faux Tan Body and gave it an above average rating of 3.5 out of 5 stars. BareMinerals Faux Tan Body comes out of the tube a very dark lotion. It’s feels pretty light but some of our testers thought it was heavier than their previous formulas. Applying BareMinerals Faux Tan Body was easy to apply with a few issues that may bother some people. It was a bit messy because of the dark guide color in it; and it took awhile to rub in. Also, we’d suggest using latex gloves when applying as the thick guide color coild get all over your palms. BareMinerals Faux Tan Bodydried extremely quickly for a lotion; which we really liked. I’d say it took about 10-15 minutes to completely dry. This product has a pretty good smell. The almond oil gives it a very distinct, “cherry” almond smell. It’s very similar to BareMinerals’ previous formula. 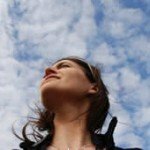 The initial smell lasts for a few hours before disappearing completely. After about 8 hours, there was no smell whatsoever (and that includes that nasty DHA smell). While not as dark as the previous formula, BareMinerals Faux Tan Body produced a really nice shade of bronze. Not only was the color good, it was very even and not streaky at all. Overall I think a lot of people will like the color. BareMinerals Faux Tan Body lasts for about 4-5 days, which is average among self tanners. It faded pretty evenly which is nice. $26.00 for 6 oz. That’s about $4.33 per ounce. Which makes this one about average for a department store tanner, but expensive compared to cheap, “drugstore” products. To buy BareMinerals Faux Tan Body, click here. 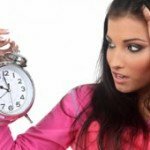 « Do Fitness Models Use Sunless Tanners?